justthefood.com...the blog: Worldwide Vegan Bake Sale! So we ended up here, in an animal loving community that welcomed us, and our four legged family, with open arms. Seriously, there are a gagillion animals around here. Horses, peacocks, dogs, cats, goats, turtles...and those are just the domesticated animals. We also have a lot of wildlife, from toads, to squirrels, to rabbits, to deer, to coyotes, to mountain lions, to those crazy woodpeckers that are always shoving their acorns in our door jam. Just about two weeks ago, I was catching up on facebook posts when I saw that one of my neighbors shared the story of a horse named Brutus who was rescued and brought to my other neighbor's house for rehabilitation. My husband and I were out back pulling weeds and cleaning up the backyard and the whole time, this beautiful, but scared, strong boy was staring me down like you wouldn't believe! Was I going to hurt him? Was I going to perpetuate the abuse he had experienced up to now in his life? Of course not, but how was he supposed to know that? All he had ever known in his short life was sadness. 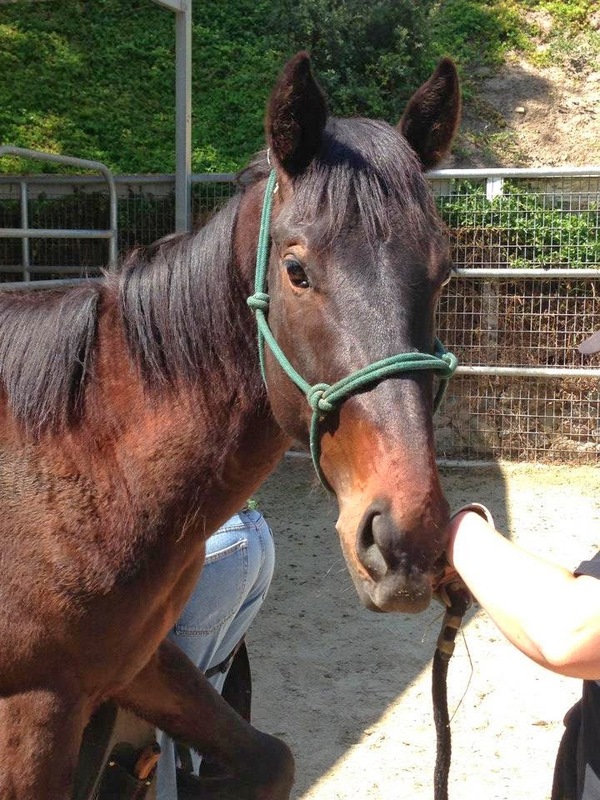 But now, he is in a safe place, thanks to the amazing hearts of both our neighbors and the folks who tirelesslly work to save these abused and abandoned horses. In fact, since he's been next door, he has put on weight, had his feet treated, and even received a very much needed surgery. Now, Brutus is walking on a lead arount the neighborhood with the ever inspiring volunteers that work to save these big beautiful animals. I am super excited to announce that I will once again be participating in the Worldwide Vegan Bake Sale! 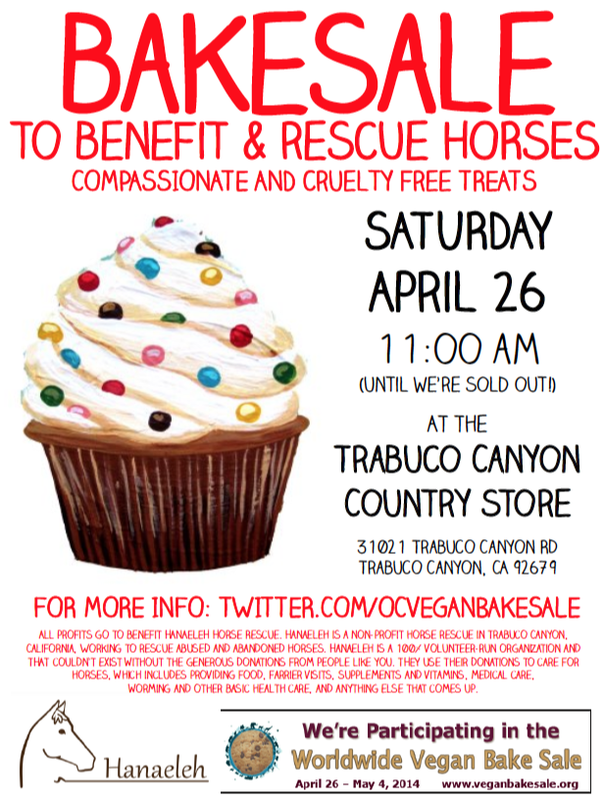 This year I am raising money to benefit Hanaeleh Horse Rescue here in Trabuco Canyon. This year, it really is a community event. Even the Trabuco General Store was generous enough to allow me to use his space free of charge for the cause (So please, if you stop by the bakesale, save a few dollars to buy a juice or a soda inside to support his business as well.) All the details can be found HERE, or on the flyer below. Please consider stopping by, or donating to the rescue directly. For more info and updates, please visit the Facebook Event Page. What is the Worldwide Vegan Bake Sale? It's an amazing grassroots event held annually, this year from April 26-May 4, in which people all over the world hold vegan bake sales to raise money for local animal charities. Anyone can do it! If you can't come to my bakesale, that doesn't mean you can't visit one in your town. Not one in your twn? Have your own. The fine folks over at WWVBS have given you all the tools you need. Their website is full of info, so go check it out. I've always been a fan of advocacy through delicious food, so this really is one of my favorite events. Yay!! What a lovely cause!!! We are planning our bake sale again too....funds going to Memphis & Shelby County Humane Society again. Can't wait! I always end up buying so much of our own stuff during the sale and eating sweets until I'm sick. Yay! Haha! Yeah, Bianca, me too!